I suppose it is requisite to wish everyone a happy ‘Family Day’, even though my reservations with this holiday, which is not really a ‘holy day’, run deep. Imposed top-down by the heavy-handed and intrusive government of Dalton McGuinty, the pre-Wynne premier, many of whose socialist and immoral policies, the ineptitude of whose government, the debt load he piled up, the boondoggles of green energy for which we are still paying in the billions, were anything but good for the family. When this day rolls around each year, I wonder yet again if the Catholic McGuinty was prompted by his troubled conscience to foist this day upon us, a forced day off, the burden of which falls squarely upon private businesses the financial burden of offering a paid day off to its employees, or time-and-a-half should they work. Of course, all good for the millions of government workers across Ontario, happy to get yet another holiday, but the burden of this falls upon, yes you guessed it, the taxpayer, most of whom work for the aforementioned private businesses. So those of us not on the government payroll are getting robbed both ways. Well, even public employees do pay; they just don’t realize it, at least not fully, and not yet. 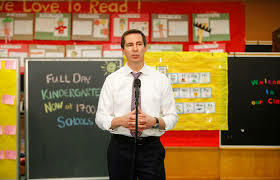 No worries for Mr. McGuinty himself, enjoying his largely undeserved and well-funded retirement, leaving a financial and moral morass, made ever-worse by the continued policies of Ms. Wynne. But I try to be an optimist, and we should take what is good in all of this; so enjoy the holiday, the blue sky and warm-ish temperatures, and make it a true holy day, by rejuvenating and reinforcing the bonds with your own family, extended or otherwise. Holy Family, intercede for us!